Frozen shoulder, also called adhesive capsulitis, happens when the shoulder capsule thickens and tightens, causing stiffness and pain in the shoulder. Most often in people with chronic diseases, such as diabetes, hypothyroidism, hyperthyroidism, Parkinson’s disease, and cardiac disease. Frozen shoulder typically develops slowly, and in three stages. Each may last for months. It then goes away slowly over the course of about a year. Any movement of your shoulder causes pain, slowly worsening, and your shoulder’s range of motion starts to become limited. The shoulder’s range of motion begins to improve. Heat applicationto the affected area, to loosen the shoulder up, followed by gentle Physical therapy is a good option. Range of motion exercises will be taught by your therapist to help recover the shoulder’s mobility as much as possible. Non-steroidal anti-inflammatory drugsto reduce pain and swelling. Corticosteroid injections. Cortisone is a powerful anti-inflammatory medicine that is injected directly into your shoulder joint to decrease pain and swelling, especially in the early stages of the condition. Continuous exercises should be done to optimize recovery. Conservative treatment works 90% of the time; however, if these treatments are not working, surgery may be necessary to loosen the tight tissues around the shoulder. Shoulder Manipulation under anesthesia– you are put under general anesthesia, and then your arm is moved into positions to loosen and stretch the tight tissue. 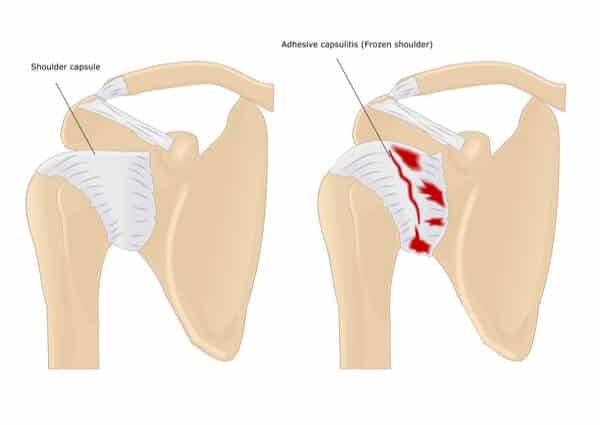 Shoulder Arthroscopy–using tubular, pencil-sized instruments inserted through small incisions around your shoulder, to cut through tight tissues and remove scar tissue and adhesions. In many cases, manipulation and arthroscopy are both done to get maximum results. Most patients have very good outcomes with these procedures. Although unusual, frozen shoulder can recur in the same shoulder, especially if a contributing factor like Diabetes is still present. Some people also develop it in the opposite shoulder. After surgery, physical therapy is necessary to maintain the motion that was achieved with surgery, and your commitment to therapy and continuously doing the exercise are very important in returning to all your daily and leisure activities.